Europe has one of best developed High Speed Rail (HRS) networks on earth. The network represents countless decades of investment from European Union member states and a rich history of rail transit on the continent. For the most part this network is comprised of state run operators running HSR service on state-owned corridors. This however is not the case in the warm countryside between Rome and Florence. Italy was the first country in Europe to open its HSR network to on track competition from private operators. Italian travelers have the choice between two competing providers, one from the state and one from the private sector when traveling between cities in the sunny southern European country. In one corner there is Trenitalia, the primary rail operator owned by Ferrovie dello Stato Italiane(FDSI), which is owned by the Italian Government. Trenitalia was formed in the early 2000’s to comply with European regulations that prohibited companies from being both the manager of rail infrastructure and the operator of rail transport. To take up the reigns as custodian of infrastructure, the government established Rete Ferroviaria Italiana (RFI) to provide signaling, maintenance and other services for the railway network. Though formally separated, the two companies are subsidiaries of Ferrovie dello Stato Italiane and wholly owned by the Italian government meaning they act as one unit. In the other corner is Nuovo Trasporto Viaggiatori (NTV), Europe’s first private open access HSR operator. NTV was established in December 2006, by the chairman of Ferrari and other prominent Italian business leaders. The company serves 19 stations and transported 11 million passengers in 2016. NTV has a fleet of 25 Alstom Automotrice à grande Vitesse (AGV) train sets, each comprised of 11 cars. The fleet was bolster in 2015 with the procurement of eight new Alstom Pendolino train sets. While the back story of NTV is fascinating, the significant part of all this is the financial performance that the company has achieved. In 2017, NTV took in close to €500m in revenue on which they made a €33.8m profit and have current assets worth close to a billion Euro. Furthermore, ridership has been growing close to 25% annually since the launch of service in 2012. This growth comes in no small part from their rapidly increasing share of the intercity rail market — growing from around 9% in there first year of service to over a third of the market in 2017. 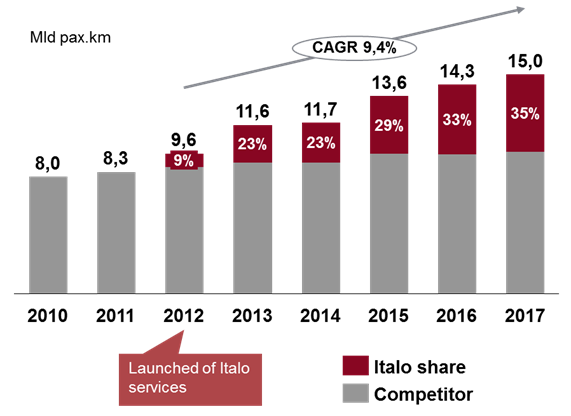 By every objective indicator, NTV has been a resounding success that in a few short years, has grown to become a real player in the Italian HSR market. This is the power of open access! An open access operator is a train operating company that is not subject to franchising, instead purchasing individual slots on the mainline from a railway infrastructure company. Although private rail operators exist in other parts of Europe, it is usually under a franchise model. Italy has become a pioneer in this space, but only after many years of contention. 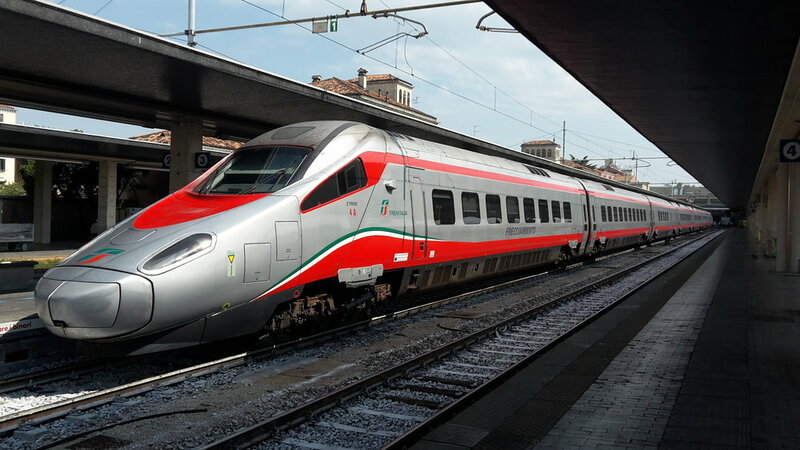 Italy took a bold step and opened up its rail network to open-access passenger operators well ahead of a European Union requirement to allow it, but it didn’t come without a fight. Successive Italian governments paid lip service to railway liberalization, but through the mid 2000’s limited progress to offering regional concessions that where subject to endless delays before ultimately being cancelled in 2009. Finally on January 1, 2010, broad deregulation finally allowed cross-border trains to run under an open access framework across Europe and set the stage for NTV. Numerous open access rail businesses emerged but it was the then upstart NTV that intrepidly placed it’s order for 50 trains. This move in 2008 poised the company to be first-to-market under the new framework. They intended to start service in late 2011, following certification of its trains in mid-2011 but ran into complications when RFI tried obstructing operations by making last-minute changes to network statements and interfering with NTV station operations. After the RFI issues and other various hiccups, NTV finally got the trains rolling for revenue service on 28 April 2012 under the .italo brand. NTV pays 120 million euros a year to lease access to the corridor. The impact of open access on intra- and inter-modal rail competition. A national level analysis in Italy. The strong performance of NTV is a testament to the power of the open access model. It allowed for entrepreneurs to create innovation in a sector historically dominated by risk averse incumbents content with servicing the status quo. The open access model is a powerful tool whose implementation should be explored globally.